To control insect populations throughout the growing season, ArborCare Tree Service uses a variety of earth friendly Systemic Insecticide products while serving our clients across Western Canada. 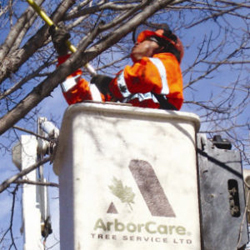 Our Certified Arborists develop custom tailored plant management programs using only the best and safest products available to limit our environmental impact. Some insects, such as the birch leafminer and elm scale, are protected from spray applications, and a variety of other insects can be tougher against the sprays that are available, such as tent caterpillars and spruce sawflies. In order to control the insect populations and combat against these insects, we require a systemic injection. Systemic controls are insecticides that are injected directly into the tree; they are absorbed by the tree directly through the xylem and carried into the leaf where it is eaten by the insect. The feeding insect will ingest the product and eventually die. Our systemic insecticides are Orthene® and TreeAzin®, which are not available to the public over the counter. Products previously used such as Confidor® are no longer available in Canada due to the price of manufacturing. Our plant technicians are trained and certified to use these products safely. Contact us today to get started.